‘Tis the season – the festivals are here and with them come good food – well read that as rich food, sweets and more. And yes, piling up on unwanted calories. So how do you enjoy the festival while still not missing the fun and yet have good food? Sounds complex? Well it’s not – healthy food need not be boring. All you need is to choose wisely and here’s how. In India, festivals are all about celebrations and no occasion is incomplete without food. Most people enjoy the traditional, high on calories food but by choosing healthy options, you can enjoy the festival without piling on calories. “Eat baked foods rather than fried or grilled samosas, bread rolls, bread pakora, besan chilla stuffed with peas, brown rice pulav. You can also have kulcha matar/channa instead of bhatura or poori. Idli, upma, pav bhaji, wheat tortillas, kathi rolls, wheat burger etc. are also great options. 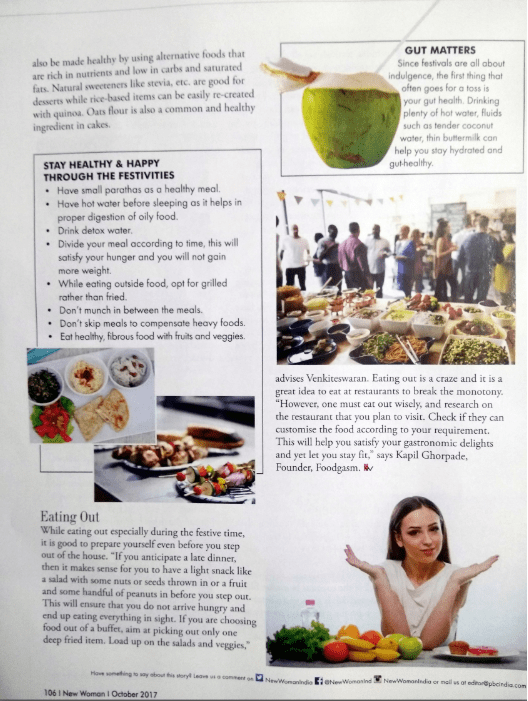 In sweets, you can have custard, sponge rasgulla, paneer kheer, sugar-free rasmalai,” advices Nutritionist Deepika Dua Arora, Mutation Diet Clinic. Festivals are all about cooking, eating and entertaining. The key to stay healthy is moderation. “Don’t cook large quantities such that you have leftovers. Cook only so much that is required for one meal. Festivals involve a lot of frying sweets and namkeens. Leave a small portion for yourself and gift the rest away. This way you stop dipping into it the day after the festivities. Prepare steamed delicacies instead of fried ones. Plan a menu based on the six tastes – sweet, salty, sour, bitter, astringent and pungent. You will find yourself planning a balanced meal. It also satiates the taste buds and reduces the urge to reach out for salty or sweets after the meal. Festival meals tend to be very carb heavy. Therefore, concentrate on giving yourself and your family enough protein through dals, paneer and the like,” adds Dr. Sripriya Venkiteswaran, Nutrition Advisor, MonkeyBox. Healthy eating begins with making the right choice of ingredients as well as cooking methods. Using air fryers and non-stick pans are healthier options. Another way is to replace core ingredients with healthier options. “For example replace at least half of the coconut in modak fillings with channa dal. It gives you a better nutrition profile with carbs, protein and fats instead of just carbs and fat that you find in plain coconut stuffed modaks. Another way to make a healthier modak is to use kodo millet flour to make modak’s outer covering instead of traditional rice flour,” advices Venkiteswaran. Again cook micronutrient dense dishes and use double the amount of vegetables in your dishes than you normally do. You can also add some sprouts and pulses and the fibre in the whole pulse and vegetables will also help you feel full and cut down food intake. Celebrity Chef Ranveer Brar advices, “using natural sugar, honey, jaggery or jaggery powder instead of refined sugar is always a good idea. Also, keeping it light with fruit based recipes, especially for desserts and chaats. With people now opting for more back to roots practices, try using millets instead of wheat and grains in recipes.” Festive cooking can be made healthy by using alternative foods that are rich in nutrients and low in carbs and saturated fats. Natural sweeteners like stevia etc are good for desserts while rice-based items can be easily re-created with quinoa. Oats flour is also a common and healthy ingredient in cakes. While eating out especially during the festive time, it is good to prepare even before you step out of the house. “If you anticipate a late dinner, then it makes sense for you to have a light snack like a salad with some nuts or seeds thrown in or a fruit and some handful of peanuts in before you step out. This will ensure that you do not arrive hungry and end up eating everything in sight. If you are choosing food out of a buffet, aim at picking out only one deep fried item. Load up on the salads and veggies,” adds Venkiteswaran. Eating out is a craze and it is a great idea to eat at restaurants to break the monotony. There are restaurants that serve very niche and healthy cuisine. During festivals, one goes overboard with eating and does not take into consideration the repercussions it can have on one’s health. “One must eat out wisely, research on the restaurant that you plan to visit. Check if they can customise the food according to your requirement. 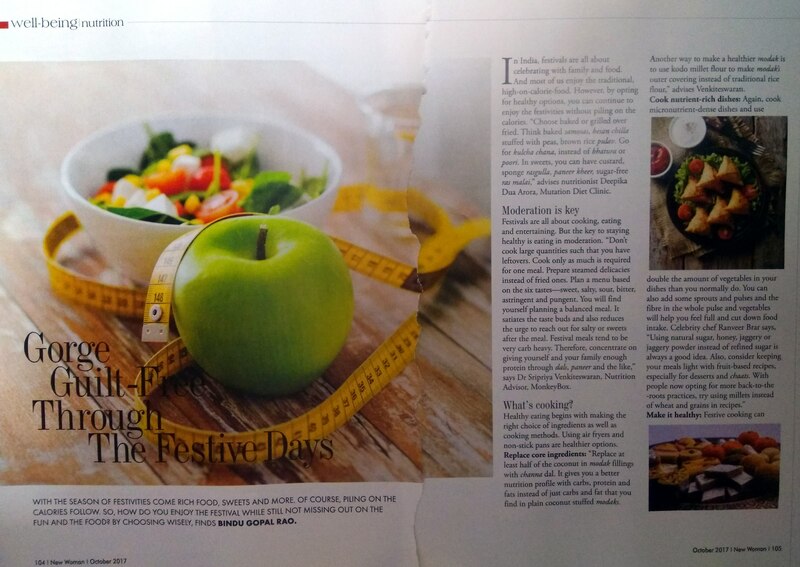 This will help you satisfy your gastronomic delights and yet let you stay fit,” says Kapil Ghorpade, Founder, Foodgasm. The first thing that gets affected during festivals is the gut. So concentrate on keeping it healthy. It is important for both digestive health and immunity. Drinking plenty of hot water, fluids like tender coconut water, thin buttermilk can help you stay hydrated and gut healthy Festivals are all about indulging oneself. In India, every festival has a meaning and the typical festival dishes served have a connection with the season and the needs of our body at that time. According to Ayurveda, sesame seeds provide warmth to the body and therefore can be comforting during the winter months. Winter months also result in dryness of skin. Sesame seeds are filled with good fats and vitamin E that can benefit skin health. Therefore, do not deny yourself festival foods just make sure to eat in moderation and don not forget to enjoy the festivities in the spirit they are intended to! Have small parathas as a healthy meal. Have hot water before sleeping as it helps in proper digestion of oily food. Divide your meal according to time, this will satisfy your hunger and you will not gain more weight. While eating outside food, try to go for grilled rather than fried. For proper nutrition, combine two types of food i.e. roti + noodles/ dosa + rice etc. Have sugar dessert once in a while in place of sweets. Don’t munch in between the meals. Don’t skip meals to compensate heavy foods. Eat healthy, fibrous food with fruits and veggies.